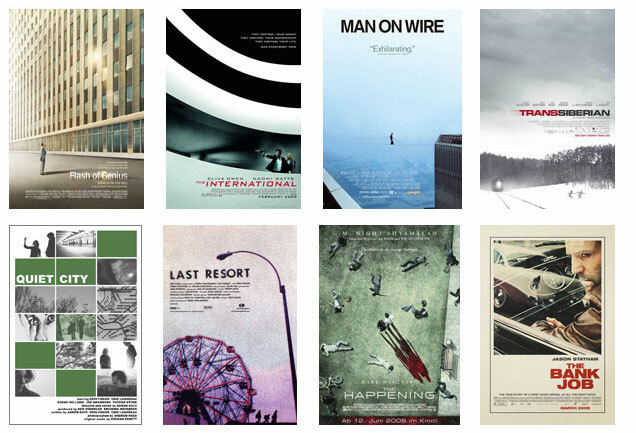 Trawling through databases of all the movie posters released in the past ten years and trying to remember my ten favorites, two things stand out: that only a very small percentage qualify as great pieces of design in their own right (there are far fewer contenders for movie poster of the decade than there are for movie of the decade for sure); and that my favorite posters have little bearing on my favorite films. In fact, I haven’t even seen the first two films on the list (OK, I just started watching the first one on HBO the other day, but I have yet to finish it). I present this list as an eclectic personal selection of posters in which graphic simplicity and typographic elegance count most of all, as well as one poster which has neither but which I love for different reasons. We welcome your own picks for Movie Poster of the Decade on our brand new forum thread where we especially hope to discover great posters from around the world that we might not have seen before. And feel free to agree or disagree with my choices in the comments below. I realize that it is ironic that this is my pick for the best movie poster of the decade since we all know that the enemy of good movie poster design is the big celebrity close-up or the floating head. 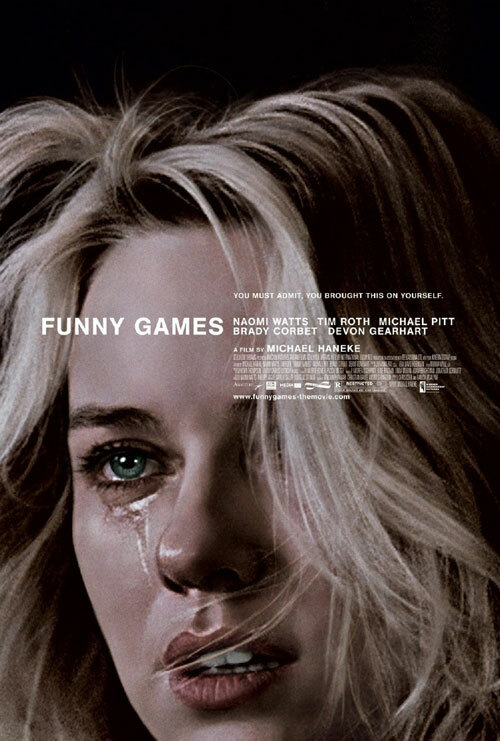 The Funny Games poster is after all nothing more than a giant close-up of Naomi Watts. But this poster both subverts and transcends that convention. I've never actually been sure whether this is a photograph or a Chuck Close-like Photorealist painting. If it is a painting then it is an exact rendition of a frame of the film, though rendered monochrome and with the background blacked out. That frame is a moment of abject terror and misery for Watts' character in the film, and yet the image on the poster, while vibrant with emotion, is also beautiful and eerily calm (and reminiscent of course of Anna Karina watching Falconetti in Vivre Sa Vie). Add to that the perfectly restrained and impeccably placed Helvetica type, and that tagline practically begging the viewer not to watch the film (if you’ve seen the Austrian original you know exactly what you’re in for) and I would challenge you to find a more striking and more indelible movie poster these past ten years. 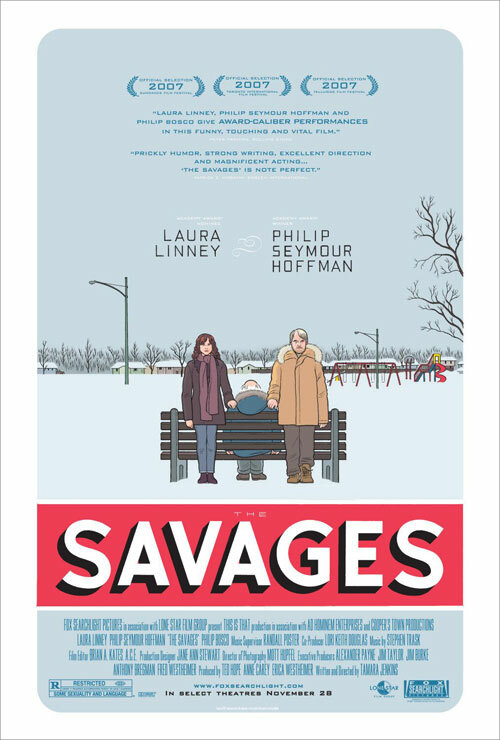 There is not enough illustration in movie posters these days, which makes Chris Ware’s poster for The Savages all the more special. Once again every element of this poster is perfectly arranged (OK, maybe the credit block is a bit too dominant for my liking), and I could look at it for hours. Philip Seymour Hoffman was memorably illustrated by Daniel Clowes (Ghost World) in 1998 in the poster for Happiness and so I initially thought this was by Clowes, but it definitely has more of the geometric precision and interest in typography of Ware (Jimmy Corrigan, the Smartest Kid on Earth). See also the Motel poster among the runners-up for another great graphic-novel-style design. The face that launched a couple of careers, and a whole slew of copy-cat movie posters: the Sears photo portrait genre. As eerily unsettling in its way as the Funny Games poster. There is nothing I like more in a movie poster than white space. Most posters (think Harry Potter posters for example) fill every inch with detail and color. (At the other extreme there is what I like to call the Nancy Myers poster: where there is a photo of the stars in a neat band and some tasteful serif typography on a white background, but that is not the kind of white space I like). 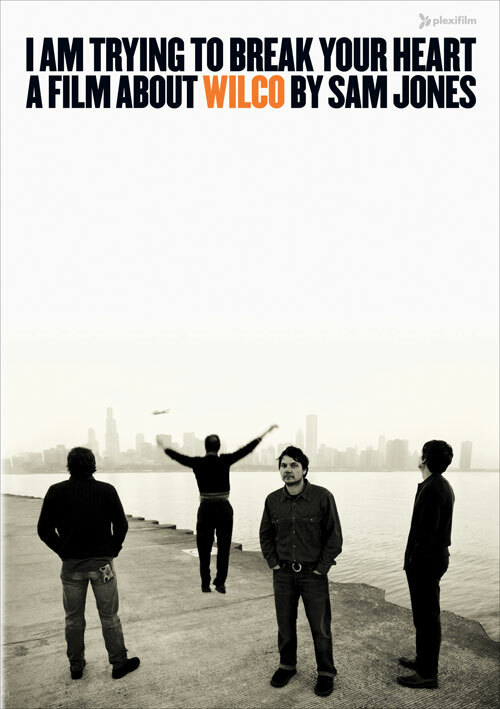 The poster for Sam Jones’ Wilco documentary is the acme of simplicity: a great black and white photograph (that tips you off to the dynamics of Jeff Tweedy’s band), acres of sky, and one of my favorite title treatments of the decade with that unconventional “a film about...” and the filmmaker’s name in the same size type...and that splash of color. More white space. Much more. 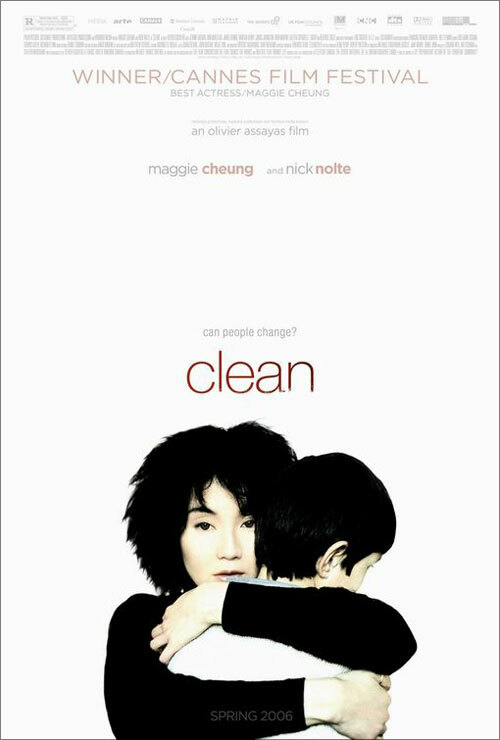 Maggie Cheung could make any movie poster look good, but this is in a class of its own. I love the credit block at the top of the poster—something designers have been experimenting with more and more (see also Funny Games), the title (more Helvetica) subtly eroding, and then that lovely high-contrast portrait. 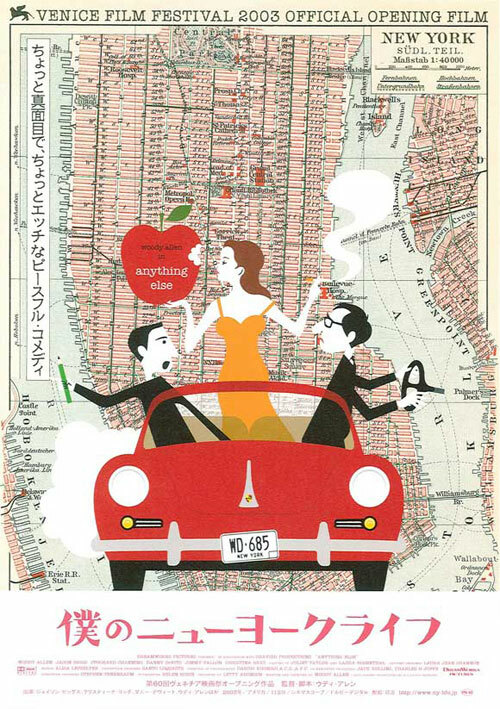 A poster I only discovered recently: the Japanese design for Woody Allen’s Anything Else. The American poster, with a grinning Jason Biggs carrying a giant heart-shaped portrait of Christina Ricci is about as bad as Hollywood comedy posters get, and I had little time for the film itself. But the Japanese poster, with its Pink Panther-esque cartoon over an antique map of Manhattan, is a keeper. Designed by Neil Kellerhouse, this is the best poster of 2009. I wrote about it here back in April and it still looks good eight months later. The original British poster for Lynne Ramsay’s wonderful Morvern Callar. 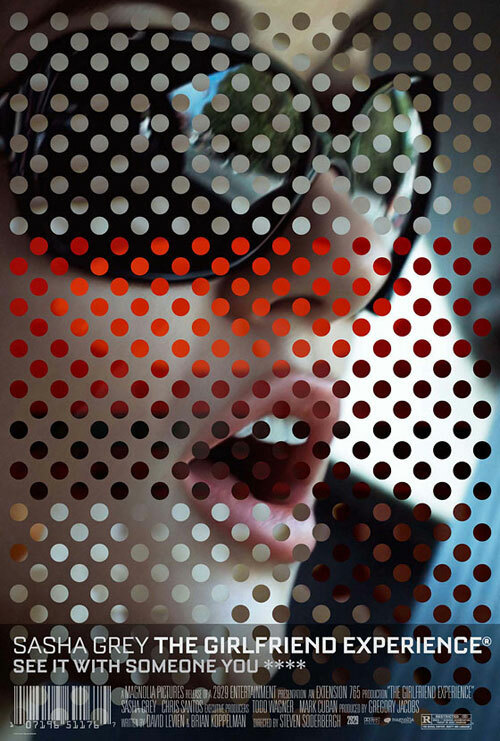 As with The Girlfriend Experience this abstracts its lead actress’s face almost beyond recognition. The (road)trippy image of Samantha Morton was adopted for the US one-sheet but didn’t work quite as well in the vertical space as it does here. There are a number of other British quad posters that almost made the grade and almost all of them (but not this one) were designed by my favorite UK poster designers All City (see Reprise, Old Joy, Crimson Gold and I Don't Want to Sleep Alone in the runners-up below). The original Romanian poster for The Death of Mr. Lazarescu is the most inappropriate movie poster of the decade and hence one of my favorites. This is not simply a bad poster (in the way that, say, the poster for the new De Niro movie Everybody’s Fine is bad), but it is a verywrong poster. Anyone who has seen Mr. Lazarescu, which is one of the great films of the decade, will know just quite how wrong this is: a Carry On poster (or should I say National Lampoon) for one of the grimmest indictments of a society that the decade has seen. In the film the dying Lazarescu is shuttled through hospital wards and treated with either scorn or indifference, not cheek-tweaking bonhomie. I have circulated the poster a lot over the past few years and I have grown to love its willful wrong-headedness. 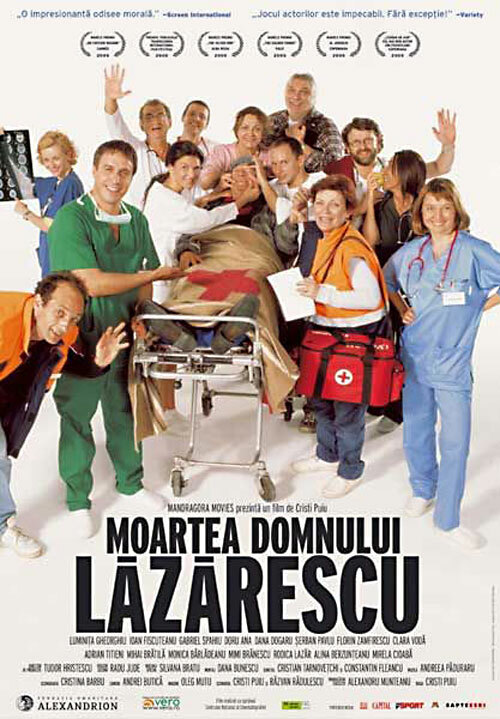 In the US the film was promoted with a picture of a stark empty hospital gurney, a couple of house cats and a lot of accolades, which does make you wonder how differently this film was seen in Romania. No “Why So Serious?” poster from The Dark Knight? The fogged/glazed over window with Ledger on it was really effective – especially in the wake of his death. That being said, I do love the choice of Funny Games. Really awesome poster for sure. I remember when movie posters were works of art you’d happily display on your wall. Now it’s just big photoshopped faces. 10 minutes with photoshop and, bam, you’re done. Good list. Two really good ones I would include are ‘Lost In Translation’ [Scarlett with umbrella] and ‘Slumdog Millionaire’. Nooo. The other Death of Mr Lazerescu poster is much better. Just him, dying on a gurney, and some cats. Perfect. Adrian, you know that the FUNNY GAMES poster actually induced a nightmare for me? Nice nod to CABIN FEVER, too. Nice call on the Mr. Lazarescu poster. I remember when I went to watch that film for the first time, every source I checked hinted (or directly said) that it was a comedy. I went in expecting a very dark comedy. If anyone here hasn’t seen it yet, there is NOTHING comedic about it (unless you’re a sadist)! Wonderful picks. The runner-ups are great as well, especially La Mujer sin Cabeza (The Headless Woman). Big props for Chris Ware’s The Savages poster (I adore Jimmy Corrigan). And, of course, that Funny Games poster is spectacular. Lots of great posters being added over at the Forum (see link at top of page). I’m especially digging the Innocence and Tropical Malady posters that I hadn’t seen before. Keep ’em coming. Great collection -and glad to see The Bank Job make your honorable mentions. Strangely, that may’ve been my #1, even though the movie itself was bland. Sorry, but The Brown Bunny poster is the best of the decade. Not even close. Samantha, I couldn’t find a hi-res of the Last Resort anyway, but I had a postcard which I scanned and which you can download here: http://twitpic.com/tf1zc. It very nearly made my Top 10. By the way, your selections on the Forum are terrific. Shannon, I guess I felt I’d done House of the Devil justice recently but it’s definitely on my Best of 2009 list. Ben, sorry for the nightmares, but don’t you love the Cabin Fever poster next to Code Inconnu? They completely forgot about Moon poster: http://afailedblog.files.wordpress.com/2009/07/moon-poster1.jpg One of the top ten of the year for me. Thanks for including Marc Ripper’s wonderful Quiet City poster!!! Stay tuned, there is more great poster work from him to come for Aaron’s new film. Alvaro, I loved the Moon poster and wrote about it here: http://www.theauteurs.com/notebook/posts/782 Top Ten of the year for me too, just not quite for the decade. I’d include film posters for There Will Be Blood (love the font used), The Wrestler, and No Country for Old Men on the list. Good list though. I think it earned a spot all the same, but that’s just me. 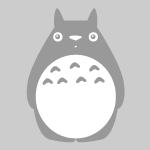 I really dig minimalism you know. Anyway, great post Adrian, and superb choices! Great list, and excellent choice for #1. Whenever I think of a great poster, that’s the first one I think of. The list has inspired me. My quest to make more film posters has been reinvigorated! The Death of Mr. Lazarescu poster is awesome, I didn’t even realize it. As a big fan of the film – I love the poster for it’s sheer irony. However, it’s spot on in terms of these people’s attitudes towards Mr. Lazarescu. I’d say you have to question the ‘role’ of the movie poster in all this. As you say in the intro, some (most) of these are outstanding pieces of art in their own right, but does a movie poster have a duty to tell you what the move is about, to sum up it’s style and content perhaps? If so some of these fall woefully short of the standards of more ‘literal’ interpretations of posters for movies over the past decade. 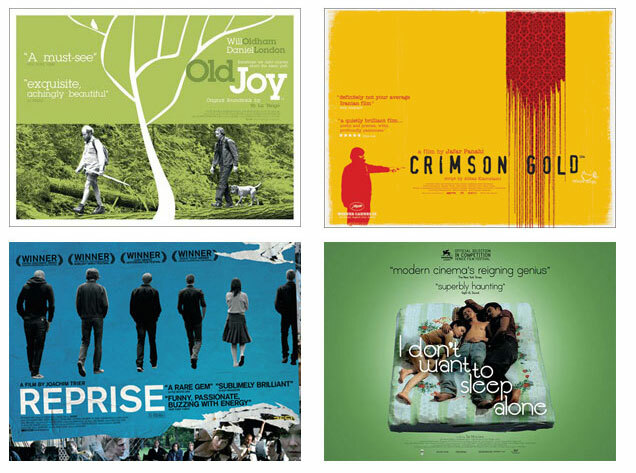 Graphic Design is ‘visual communication’ and if the poster doesn’t communicate what the film ‘is’, does it work? Is it then a good poster? Or is it a greta piece of fine art? is just mindblowing. Great find. I pick the Girlfriend Experience but it would be sweet if Taxi Driver was on the list. I know it’s recent but the Up in the Air I think has a great poster, especially how it ties into a shot in the movie, which was very cool to see. “Moon” was the most iconic this year. I was arrested by “The Girlfriend Experience”, that’s my favourite of the lot. “Funny Games” running a close second. I’m gratified that “Precious” didn’t make the list, I personally balk at blatant Saul Bass reflux. 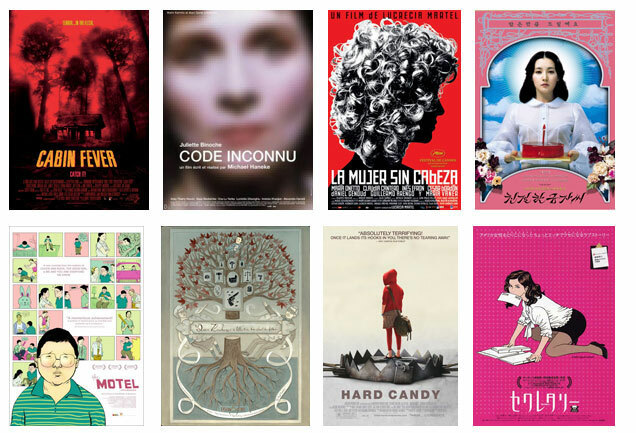 I personally think that some of the titles that landed in the Runner-Ups catagory are more impressive than several that made the cut: “Hard Candy” is a powerful one, and I love the 70’s-retro feel of “The Bank Job” poster. And I agree with Dan R: the “Why So Serious” poster for “The Dark Knight” is incredible! Why that didn’t make the cut is a mystery to me. The House of the Devil and a few other glass eye release got GREAT posters. I Sell The Dead and the Roost got great ones, too. funny games is no.1 !!! Precious – The hands down winner for 2009!! I gotta admit, I like a lot of the runners-up quite a bit more than most of the 10 that made it. I love all the comments but a lot of people are suggesting posters from the 90s or even before (Taxi Driver?). It’s movie posters of the decade, people! A lot of the posters mentioned here (Moon, House of the Devil, Margot at the Wedding) I have featured before. All are terrific. Please check out my follow-up post here for some other great selections. Huw, you’re right that there’s a world of difference between an effective advertisement and a great piece of graphic art. I was trying to choose the latter, though I do think that a gorgeous poster at least stops you in your tracks and is effective in that way even if it doesn’t tell the whole story. In terms of advertising the It’s Complicated poster is probably exactly what is needed to get its target demographic into the theater but is less interesting aesthetically. The Hard Candy poster should have been in the top ten. The Dark Night poster with “Why so serious” is one that will be stuck in my mind for a long time. Most of the posters for Where the Wild Things are were also very nice, as well as the beautifully illustrated V for Vendetta ones. Maybe this one is just sheer bias, but I loved the posters for Wes Anderson movies. It’s the same thing we do with Chekhov. We see his comedies as dramas… re: The Death of Mr. Lazarescu. This title alone is an ironic biblical suggestion as well. Social satire. Comedy abounds. Wonderful posters all of them….everyone brings forth a new dimension and aspect. I have always liked the poster for “Man on a wire”. I would like to mention two of my personal favourites here…the poster of “La Dolce Vita” from the eponymous Fellini movie and “Apu Trilogy” poster by Satyajit Ray. That “Anything Else” poster is really terrific . I think the poster artist spent more time on the poster than Woody did on the film. I like Kristin Scott Thomas’ face in the poster for I’ve Loved You So Long. Utterly devastating and haunting. I agree there should be one of the Dark Knight posters somewhere on this list even if it is honorable mention. Oh my goodness what an honor! I’m the Illustrator for Palindromes: Kathryn Rathke, working in conjunction with the mighty designer, Naomi Mizusaki, of Supermarket Studio. That one was a blast. The idea that the Moon poster didn’t make the top 20 is just silly. I’ll give you the the Funny Games poster, but the Moon poster wipes the floor with every other pick. How about Collateral, There Will Be Blood, The Crow, Atonement, or The Green Mile (the one with Hank’s Face) Funny Games and The Girlfriend Expirience are iconic. the one with the tree,near “Motel” and “hard candy”, what movie? Oldboy and Kill Bill Vol.1! I don’t agree with all of these choices, but I’m pleased to see that I am not the only person who loves the “Funny Games” poster. I haven’t seen the film, but that poster is incredibly striking and eerily beautiful. Also, does anyone know where you can buy that Reprise poster? Kathryn, thanks for getting in touch. 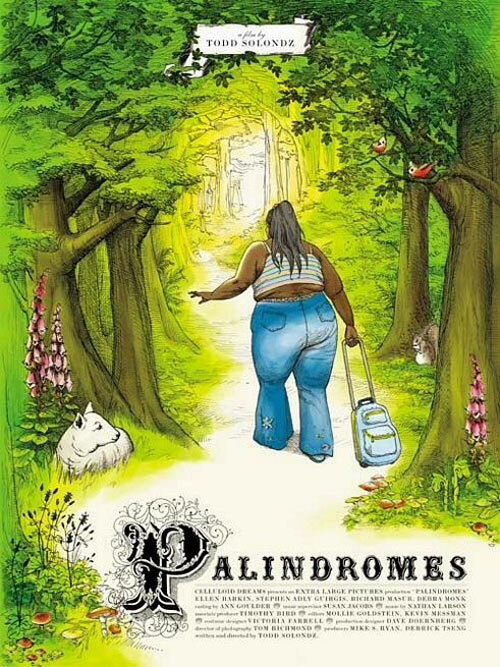 Glad to put a name to that wonderful Palindromes illustration. Tenzin, Japan was pretty well represented in this and my follow-up post but I’d love to see more great recent posters from China if you know of any. Gabriel, the poster with the tree is for Dear Zachary, illustrated by Evan B. Harris. I wrote more about it here. The British poster for ‘Moon’ is rather good too. The Savages poster have an interesting style. What’s the poster between “The Motel” and “Hard Candy”? Excelent choice of FUNNY GAMES and CLEAN, is there a way to download those pics. of the top 20 I¨ll say HARD CANDY, OLD JOY and I DON´T WANT TO SLEEP ALONE are the best ones. where is the poster for CHOKE??? When I was a kid I always had movie posters on the wall of my bedroom and looking back I can see how my tastes of radically changed. Hanging from my walls were Arnie himself, as Commando and the poster for Predator as well as A Nightmare on Elm Street and other such movies a young boy likes. However I do recall a poster I bought for a movie I’d never seen and still haven’t called “Fright Night”. I think I took it down one night because it was giving me the creeps. Anyone recall that one?